Books don’t write themselves. Authors have to put in the hours at the desk getting those words written. But a writer’s life isn’t all carried out sitting at the computer or scribbling in a notebook. I get a lot of my best ideas when I’m away from the writing cave. Sometimes they’ll come unbidden when I’m sitting on a train or bus, or gardening or cooking or doing some housework. And I’ll often solve a plotline problem or come up with a story development when I’m out for my daily walk. It’s as if my brain goes off on a walk of its own when I’m doing other things. But as well as the normal and necessary daily breaks that form part of my writing day, there are also more formal and organised times where I’m out and about as an author. In the last week or so I’ve attended two such events. The first one was at a local business fair where all sorts of businesses and organisations were invited to hire a table and not only network with each other, but enjoy the chance to engage with members of the public who popped into the venue as visitors to the fair. So, as a local business – i.e. 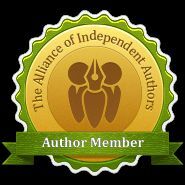 indie author-publisher I decided to sign up. I invited another local author to share my table and we had a fantastic day. The weather was awful but that didn’t seem to put the visitors off, and from 10.30a.m. till 3.00p.m. the rugby club venue was buzzing. Me and my colleague talked to lots of lovely and interesting people about our writing and we sold a fair few books as well. We gave also out fliers, bookmarks and postcards to folks who preferred to buy our books in e-book format or who wanted to pass on information about our books to friends, family and libraries. It was also a great chance to network with all sorts of other local businesses, from handbag and jewellery makers to gin distillers and stately home administrators. The second away-from-the-desk event was an evening spent talking to members of a reasonably local branch of the Scottish Women’s Institute. I always enjoy talking about my books and how I became a writer and this event was no exception. I was made very welcome and I was asked some very good questions. Even better was the fact that a couple of the members had already read my books and recommended them to the others. I should also add that the homemade lemon drizzle cake that was served with my post-talk cup of tea was delicious and, again, I sold a good number of books. The above events are just the latest in a fairly long list of author events I’ve done in the last few years. I’ve taken part in book fairs, a book festival and a craft fair. I’ve given talks in libraries, in schools and to various groups. I’ve also delivered writing classes both to adults and to children. And, as well as the chance to promote and sell my work, it has all been very enjoyable. It’s great to get a chance to talk about my writing, to share what has inspired me and how I go about crafting a novel. And it’s even better to inspire others either to read, or to write, or both. So yes, for me, as a writer, time spent working away from the desk is every bit as important as the time spent actually working at it. What’s your view of writers getting out and about? As a reader do you like meeting authors at book events? Or, if you’re a writer, do you find time away from the desk is time well spent? I so agree, Anne. My favourite part of being a writer is mixing with readers. I love going to craft fairs, schools, libraries etc. Writers can spend too much time in front of the computer. Sound like you have been doing some fun things. I actually did a couple of visits to senior centres. They loved it and bought books for their grandchildren and even some for themselves. I wrote about a recent visit to a school in my latest post. Great minds do think alike!! I saw that! Thanks so much. Thank you for this Anne. I agree with you, a writer needs to get out and about and not only for writing events. These are great though to interact about one’s craft. All kind of things inspire me. Going to the cinema, an exhibition, a museum, travelling. More recently, the Climate March on Friday in Toulouse with the younger generations and the Matsuri (Japanese festival) that a long-standing Japanese friend organizes every year in our town on the outskirts of Toulouse. Have a pleasant week. Sun and cloud here today. It should be going up to 21 degrees at the end of the week. Hi Susan, thanks for visiting and commenting. Yes, like you I enjoy getting out and about to non-writing related things too. The Japanese festival sounds interesting. You have a good week too. I envy your warm weather. It’s a chilly 5 degrees here. Thanks Richard 🙂 I hope you’re busy writing too. Well done with the short stories. Yes, it was a lovely day here too. Excellent win over Manchester United and good season so far. The husband is happy 🙂 And Aberdeen doing well too – so all good with Mr S.